This requires the Cyclops Core and Common Capabilities libraries! Integrated Dynamics is a mod which requires you to build networks for complex automation and system integration. It is a mix between bundled redstone, BuildCraft gates and Applied Energistics-style networks. Transfer items, fluids and energy with the Integrated Tunnels addon! Enable autocrafting in your network with Integrated Crafting! Overview and control your network using Integrated Terminals! Interact with your networks over HTTP with the Integrated REST (advanced) addon! This mod provides an in-game guide 'On the Dynamics of Integration', which also contains tutorials. All players will receive this book on first spawn, but it can also be crafted by combining a regular book with two pieces of crystalized menril chunks. Use 'Readers' to import external values into the network using 'Variables'. Different types of readers are used to capture the outside world. Different types of writers can be used to interact with the world. Each reader has countless aspects to read properties. Display the variable values on a display for debugging, or if you want to make things fancy. Mod interactions at its finest, which is one of the main goals of this mod. Perform complex operations with the Logic Programmer on your variables to automate tasks. When using variables inside such operations, place them inside a Variable Store to make them accessible to the network. Immersive crafting system for creating everything in this mod, JEI support is available. Hide your cables inside Facades to make your network blend in with the rest of the world. Visual feedback, since logic networks can become quite complex. Use operators as values, to perform functional operators like map, filter and reduce. These can also be used in combination with Charset pipes to create fully-fledged fine-grained sorting systems. Recipes are first-class citizens in Integrated Dynamics. You can define them yourself in the Logic Programmer, or read them dynamically from machines using the Machine Reader. 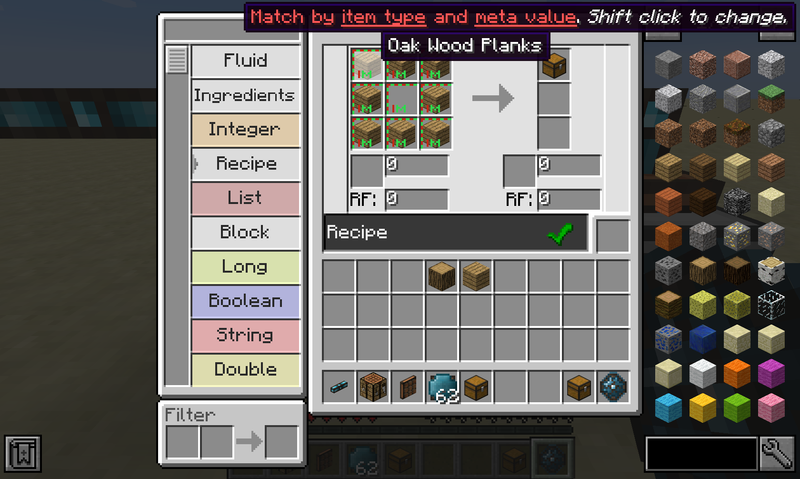 Recipes are used extensively in the Integrated Crafting mod. With this kind of Recipe logic, you can create complex logic systems, such as a system that looks up the recipe for a given item. Server admins can use the /integrateddynamics networkdiagnostics command to open a gui for detailed ticktime tracking per network part.